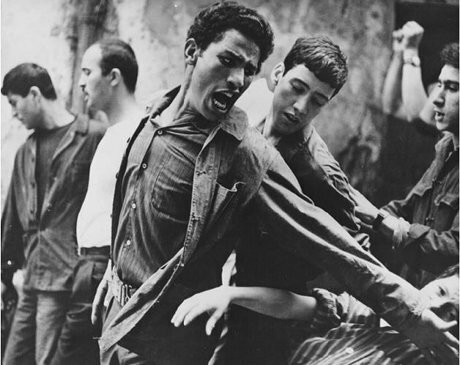 Inspired by Yacef Saadi’s account of his experiences as an F.L.N (Front de Libération Nationale) military commander, Gillo Pontecorvo’s seminal 1966 work The Battle of Algiers dramatises Algeria’s struggle for independence between 1956 and 1957, during which the nationalist movement shifted its focus from rural Kabylia and the Aurès mountains to the capital, Algiers. As the film illustrates, this renewed emphasis upon guerrilla warfare attracted both the attention of the international community and witnessed the increasing participation of women within the conflict, as female nationalists (known as mujahida) were tasked with carrying information and weapons through the besieged city. Traditionally, film scholars have tended to regard Pontecorvo’s representation of gendered nationalism in positive terms, as the dramatization of a post-colonial national identity predicated upon sexual equality and egalitarian values. Nevertheless, as this article will illustrate, this hypothesis is somewhat problematized by the cinematographic patterns inherent within the film (lighting, framing and camera movement), which instead reveal an underlying subtext of gendered mutual exclusivity and sexual difference. In the Battle of Algiers, decisions regarding the cinematography of the film were decided by Marcello Gatti, who used telephoto lenses, fluid/unstable handheld cameras, and high levels of graininess/contrast to deliberately mimic the aesthetics of newsreel/television footage. Pontecorvo also used ‘contratype’ that is, a negative reel made from a positive reel to enhance the amateur look of the narrative, whilst the disclaimer ‘not even one foot of newsreel or documentary film is included in this picture’ seems to invite the audience to view the film in terms of ‘documentary realism,’ emphasising the relationship between image and reality, sign and referent. These techniques are particularly evident when Pontecorvo focuses on the two masculine ‘heroes’ of the film, Ali La Pointe (the leader of the insurrection played by Brahim Haggiag) and Si Djefar (the orchestrator of the bombings played by Yacef Saadi). In particular, both protagonists are frequently depicted using harsh, high contrast lighting - a technique known as chiaroscuro (or the ‘Rembrandt effect’), often used within western, narrative cinema to suggest psychological depth, the unconscious mind and subjectivity. Furthermore, in depicting these ‘heroes’ of the revolution, Pontecorvo often uses framing techniques inherited from 1920s Soviet social realism (popularized by directors including Sergei Eisenstein) and 1950s Italian neo-realism (associated with directors including Federico Fellini and Roberto Rossellini), both of which privilege exterior locations in and a focus upon ‘the people’ as opposed to the individual characteristic of classical Hollywood narratives. In The Battle of Algiers it is the winding topography of the Casbah and the neo-classical boulevards of the European quarter that form the main locus of narrative action. Nevertheless, in its framing techniques, Pontecorvo’s film arguably defines the ‘people’ in fundamentally masculine terms; as a Revolution comprised of male ‘heroes’ and martyrs (see figure 1). 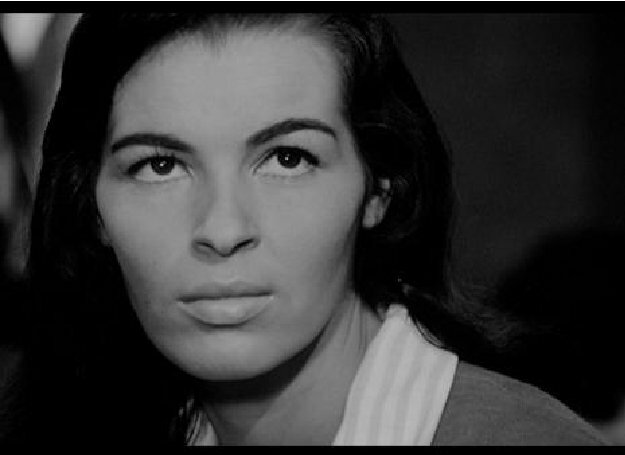 On the other hand, one scene in Pontecorvo’s film appears atypical in its cinematographic patterns. Set initially within an interior, domestic space filled with mirrors, the scene in question depicts three Algerian women disguising themselves as European settlers in order to carry explosives over the restrictions placed on the war-torn city. As with the famous female resistance fighters Zohra Drif, Samia Lakdari and Djamila Bouhired, in an act of revolutionary masquerade, they manipulate the fixed, binary logic of colonialism through shifts in appearance, from veiled (haik) to a comparatively ‘Westernised’ form of dress. Depicting Algerian women as active agents in the conflict, it is this scene which has led many theorists to view the film positively in terms of its gendered representation. Nevertheless, this is the only point at which the spectator is allowed any access to the female revolutionaries involved in the struggle; for the remainder of the film, female participants remain either silent within the narrative or part of the anonymous masses. Furthermore, this scene enacts a crucial stylistic shift from the neo-realism of the (masculine orientated) crowd scenes to a more conventional form of cinematography, drawing rather from the conventions of classical Hollywood cinema and its representation of female stars such as Marilyn Monroe and Greta Garbo. One way in which this shift takes place is through patterns of lighting, from the naturalistic techniques that deliberately mimicked the ‘gritty’ aesthetics of newsreel/television footage, to three point lighting (comprised of a key, fill and back-light) a technique traditionally used by Hollywood directors to reduce the illusion of depth demanded by the narrative, giving flatness, the quality of a cut-out or icon rather than verisimilitude to the screen. Furthermore, a particular emphasis upon soft, frontal lighting, is apparent here, bathing the faces of the mujahida in a quasi-translucent glow that - at certain points - threatens to disrupt the fragile illusion of realism insofar as it is constructed by the narrative. Indeed, Ranjana Khanna describes the bombing sequence as ‘contrasting starkly with the high neo-realism of the crowd scenes’- an observation which casts doubt on the film as representing gendered nationalism in equal and objective terms. Furthermore, framing techniques used here are also reminiscent of classical Hollywood conventions, visualising a shift from exterior locations and ‘the people’ (framed with wide shots) to a singular focus upon the individual (using medium and close-up shots). Whilst ostensibly representing female mujahida actively participating in the struggle, this shift in framing techniques thus simultaneously appears to remove the women from the Revolution (a tension expressed between the content of the film and the ways in which this content is articulated through film language). In other words, whilst men are symbolically associated with the streets and ‘the people’, (through cinematographic patterns appropriated from Soviet social realism and Italian neo-realism), through patterns of framing (characteristic of classic realist Hollywood cinema), women’s role within the conflict is posited as singular, atypical and ultimately contingent upon on the male ‘heroes’ of the uprising (figure 2). Despite its iconic status in the canon of films depicting the Algerian War, The Battle of Algiers is nonetheless problematic in terms of its representation of gendered nationalism. In particular, as this article has shown, through cinematographic shifts in lighting and framing, Pontecorvo arguably associates the male heroes of the Revolution with subjectivity and ‘the people’, whilst the mudjahida emerge rather as warped Hollywood stars, stripped of their agency through an obsessive and singular emphasis upon their physical appearances. In this way, whist the film ostensibly represents the struggle in objective terms, cinematographic patterns inherent within the film nonetheless reveal an underlying subtext of gendered mutual exclusivity and sexual difference.